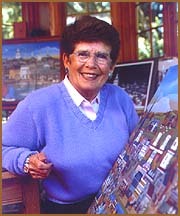 My first introduction to Art was through my aunt, Margaret Brown, who owned a gallery in Boston. She encouraged me, as a child, to take art lessons at the Boston Museum of Fine Art, which turned out to be the last formal art training that I had. In the late 1960s, when my children were in school, I started painting for pleasure and relaxation. It was not until the mid-1970s that I became more serious about my art and began painting professionally. Since that time, I find myself painting daily. My first paintings and prints focused on scenes and landmarks from the Delmarva Peninsula on the Delaware coast. The works tried to capture the family holidays that were enjoyed by residents of Washington, Baltimore, and Philadelphia, who journeyed by rail and coach to enjoy the tranquility of the seashore. Many of the structures in my scenes no longer stand, due to time, hurricanes, and the unending wave of development. The beach scenes are sold in many of the local Delaware galleries to vacationers who feel that the paintings express the nostalgia and enjoyment their families have enjoyed. Many of these scenes are no longer in print but I have tried to create a new print each year based on the long history of vacationing on the Delmarva. The exhibition of my art at the Rehoboth Art League in Delaware lead to my collaboration with a Washington entrepreneur, Dr. Ralph Jones, and the creation of the “Splendor of Washington” series. The capital’s famous buildings are displayed as they appeared at the turn of the century with imaginative illustrations and stories of the people who lived in the city during those times. The series now numbers some three dozen scenes at different times of the year and celebrating most national holidays. These paintings are distributed as prints and greeting cards that are sent by most Washingtonians with Christmas and special occasion greetings. During the past several years, I have been able to marry folk art with maritime art, thanks to the support of Mystic Seaport, in Mystic, CT., which commissioned me to paint the “Port Cities Collection.” I have been able to travel to all corners of the United States and revisit the famous seaports at the turn of the twentieth century. Researching the life and times of our famous seaports has added a new dimension to my art. My most recent paintings include Tidewater Days, Historic Annapolis Days passed, The Steamship Savannah, and the Parade of Lights in Charleston.